Email Franco Busetti with comments, ideas, suggested links and broken links. 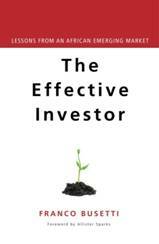 The Effective Investor is essential reading for novices, professional investors and investment advisers in emerging markets who want to understand the most important principles of successful investing. Unlike the promises in many populist investment books, this book won't make you immensely wealthy quickly. It may not even make you immensely wealthy slowly. What it will do is explain the most important features of how the stock market works; guide you into forming realistic expectations; help you to avoid the most common pitfalls and evaluate investment information critically, as well as show you how to reduce risk and enhance returns. It will save you money and it will save you time. Franco Busetti has been an investment professional for 25 years. Originally trained as a chemical engineer, he has also completed a B.Comm. (Hons) in economics, the CFA, a B.Sc. and an M.Sc. in artificial intelligence. He was Head of Research at Absa Securities before becoming Strategist and Head of Quantitative Research at JP Morgan and Credit Suisse Standard Securities. Franco has been rated 45 times in ten different investment categories in the Financial Mail analyst ratings, and has been ranked first in investment strategy, quantitative research and innovative research. Note that articles and references are normally linked to the actual documents, usually in PDF format. You can left-click to open in Adobe Acrobat or right-click to save while continuing to browse. Another core quantitative site is the Condensed Matter (cond-mat) section of the Los Alamos National laboratory site of downloadable papers, which is searchable. A key resource. South African users can use the local mirror sitefor more speed..
CiteSeer Autonomously creates citation indexes of scientific literature. An excellent search tool for literature searches. Documents Search Useful for economics-orientated research information on-line. BibEc includes printed economics publications, not available on-line as downloadable files, while WoPEc includes information about documents that are available in electronic form. MathSciNet. American Mathematical Society database. Superior database but subscription required. Mathematical Optimisation An excellent overview of classical and heuristic optimisation techniques. Relatively easy reading. A superb collection of papers can be found on the SmartQuant site. Areas covered include neural networks, CAPM, portfolio selection, general optimization, portfolio optimization, heuristic optimization, neural optimization, VAR, genetic algorithms, prospect theory, simulated annealing, technical analysis, tabu search, data patterns, game theory, bond pricing, multi-agent simulations, option pricing, monte carlo simulations, volatility estimations, time series analysis, swap pricing, fuzzy logic, arbitrage trading, fractals and chaos and term structure. First, a list of selected, market-orientated Top Referenceswe have compiled. A huge time-saver, the distillation of many hours of hunting! Emphasis is on optimisation of investment problems, using heuristic methods, particularly genetic algorithms. Financial AI This page, maintained by Robert R. Trippi (co-author with Lee, J.K. (1992) ofState-of-the-Art Portfolio Selection. Chicago, Illinois. Probus. - a useful reference) is intended to provide short cuts for visiting places of interest to persons involved in applying AI to finance and investment problems. In the same vein, a short bibliography of some of the Top Texts in these fields. Buy them at Amazon. AI, Cognitive Science and Robotics .Artificial intelligence research groups and resources. Loads of FAQs on all AI topics from the Center for Scientific Computing (CSC), the Finnish national large-scale computing facility. A Survey of Global Optimization Methods. Succinct taxonomy of optimisation techniques, with a couple of relevant references and software links. Scientific Publications of Science & Finance provides a list of scientific publications from science and finance researchers, tackling topics such as financial markets, options, risk management and portfolio optimisation. Registration required to access the research library..
A young journal which publishes articles that reflect the increasing use of quantitative methods in finance such as asset creation, pricing and risk management is Quantitative Finance. It also covers new developments such as agent-based modelling and evolutionary game theory. Subscription required. Econophysics. Problems in economy and finance have recently started to attract the interest of statistical physicists. A fundamental problem is the existence or not of long-range power-law correlations in economic systems as well as the presence of economic cycles. For serious quants, such as statistical physicists. Journal of Econometrics. You need to subscribe in order to download papers. Informs Online. Database and general OR resource. Journal of Heuristics. A forum for advancing the state-of-the-art in the theory and practical application of techniques for solving problems that cannot be solved exactly. Search engine can be used for general literature searches, but requires subscription. Journal of Financial and Quantitative AnalysisThe JFQA publishes theoretical and empirical research in financial economics. Topics include corporate finance, investments, capital and security markets, and quantitative methods of particular relevance to financial researchers. Financial Analysts Journal. An extremely useful resource. Electronic copies of papers are now available back to 1997. Lindo and Lingo are classical linear and nonlinear programming solvers from Lindo Systems. The demo versions are fully functional but have a restricted number of constraints and variables. Optimization Software An interactive decision tree approach to selecting software. Fairly limited in scope. The Neos Optimisation Software Guide run by Mittelmann and Spellucci, provides software sorted by type of problem to be solved, as well as benchmarks and test cases. If you are willing to eschew commercial software and get your hands dirty, tryThe Stony Brook Algorithm Repository. SmartQuant is a software toolbox, which provides a researcher or quantitative investor with an advanced object-oriented data mining and analysis framework. NNs, GAs and the usual AI suspects are offered. Simtools is an add-in for Excel, providing statistical functions and procedures for doing Monte Carlo simulation and risk analysis in spreadsheets. Insight is a suite of Excel add-ins for quantitative analysis, along with its accompanying tutorial documentation, and provides Monte Carlo simulation, decision trees, queuing simulations, optimization, Markov chains, and forecasting. Frontline Systems, the creator of Excel's Solver, supplies a range of spreadsheet solvers, including the GA-based Premium Solver. The Power Utility Pack trial provides all the utilities you've ever wanted for Excel from THE best Excel resource:J. Walker and Associates. Operations Research Add-ins. Optimisation-related add-ins, from Paul Jensen at the University of Texas. Some good stuff. Tired of manually adding labels to Excel scatter plots? Download here: Addlabel by Rob Bovey , which does it automatically. We've used it for ages without any problems. Michael Trick’s Operation Research Page (now the INFORMS OR/MS Resource Collection) is arguably the premier OR site. The IFORS Tutorial site provides many useful interactive tools for classic OR problems. Tom Cavalieri's Optimization Links Another general and comprehensive AI site. WORMS - World-Wide Web for Operations Research and Management Science - an Australian OR site. The CMU Artificial Intelligence Group contains public domain and freely distributable software, publications, and other materials of interest to AI researchers, educators, students, and practitioners. A brand-new resource is EU/ME (get it? ), the EUropean chapter on MEtaheuristics. Their working group on metaheuristics intends to provide a forum for researchers in the field of metaheuristics and to provide its members with information on this topic. Yahoo AI. A good general starting point to various AI areas such as optimisation, fuzzy logic, inference and neural networks. KD Nuggets. A guide to data mining, web mining, knowledge discovery and eCRM. Kaisa Miettinen, a Finnish page of links. A slightly different slant to the usual, so it doesn't overlap too much with the others. Eric Weisstein's World of Mathematics. Encyclopaedic in scope: 9590 entries, 168634 cross-references, 3830 figures, 86 animated graphics, 936 live Java applets. Sponsored by Mathematica. An absolutely superb site. Math on the Web. A general mathematical meta-site. The Amsterdam Institute of Finance offers courses in finance, derivatives, asset management and credit risk. Swiss Finance Institute. Similar topics are offered. Financial Conferences. A searchable database of conferences/courses worldwide, although the emphasis is on the UK. ICBI the International Centre for Business Information. Imperial College. Management School-OR Library. Strong operations research centre. The OR-Library is a collection of test data sets for a variety of problems and the site is a useful source of references and working papers.